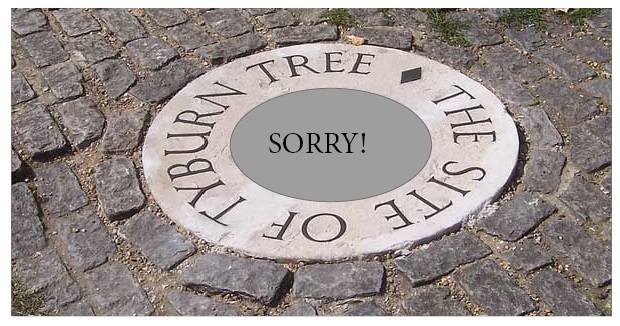 Now that we know the Pope has made an apology on behalf of Catholics who were involved in defending the Church and the Truth during the Reformation, perhaps the Tyburn Tree Memorial can be 'modified' slightly. 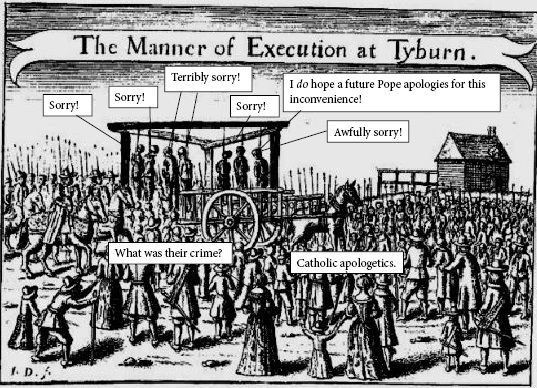 That we have a sorry pope, I'm sure all can agree. Brilliant! Your wit and humour are an aid in being light-hearted during these grim times for we poor Catholics, so battered an bruised by you know who....this made me smile - a lot! Thank you Mr. Bones! So sorry I ever gave the N.O. a dime - can't wait to sign on to the class action suit! Isaiah 3: FOR behold the sovereign the Lord of hosts shall take away from Jerusalem, and from Juda the valiant and the strong, the whole strength of bread, and the whole strength of water. The strong man, and the man of war, the judge, and the prophet, and the cunning man, and the ancient. The captain over fifty, and the honourable in countenance, and the counsellor, and the architect, and the skilful in eloquent speech. And I will give children to be their princes, and the effeminate shall rule over them.